Do you have a party where everyone brings their favorite cookies and recipes? I have heard about such shindigs but no one has invited me to one. Perhaps they are worried that I will show up with carrot sticks or kale cookies. Below is one of my very favorite cookie recipes. I used egg whites to make a meringue and then folded in some chopped almonds. The nutmeg makes this cookie more adult – and wonderful with coffee or tea. They are super easy to make if you have a stand mixer. If not, a hand held mixer will work – but you will have to hold the ingredients in one hand and slowly pour while you mix with the other hand until the egg whites are stiff. Please share your favorite cookie recipes below. Preheat oven to 250 F. Line 2 cookie sheets with parchment paper. Using stand mixer with a whisk attachment or a hand held mixer, beat egg whites until starting to get fluffy. Slowing drizzle the brown sugar, salt, and nutmeg in the bowl while you continue to whisk. When the batter is stiff (like cookie batter), gently fold in the vanilla and almonds. Drop cookies using a spoon onto the cookie sheets in rows of five (each cookie sheet should fit 20 cookies – they do not spread). Bake for 20 minutes. Going to give these a try. I actually have everything in the pantry to make these today.. There is a similar delicious recipe on allrecipes called Soldier's Kisses. Your version sounds good also thanks for sharing! How did you calculate the nutritional value? Mine came to 87 calories each so I was curious. 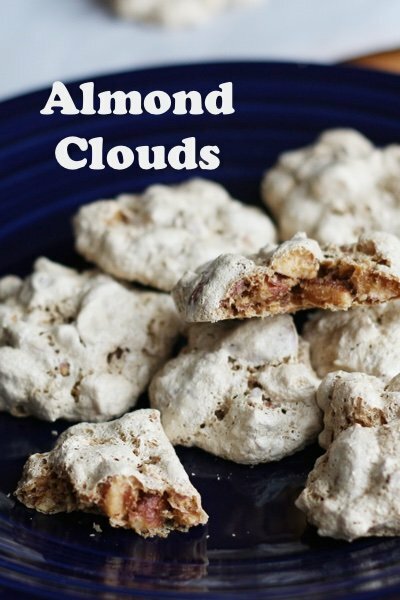 I used to make a version of these for Christmas; only tinted w/a few drops of green food coloring and some mint chocolate chips added instead of nuts. B/c they are so light you wanna eat a bunch! I made these last year for my gluten free son-in-law because all the rest of my traditional Xmas cookies are “gluten filled.” He and everyone else loved them. So easy to make and so delicious. I’ll definitely make them again this year, but a double batch!! 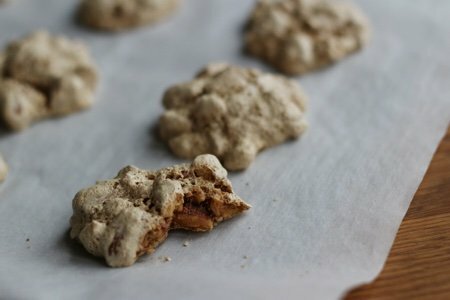 Would Truvia baking sweetener work with these cookies? I use it with most of my baking and it works fine. No cream of tartar is needed? I had a recipe very similar that called for cream of tartar.